Temperature differential of approximately 3 to 11°C (5 to 20°F) depending on rate of temperature change, location, mounting, etc. 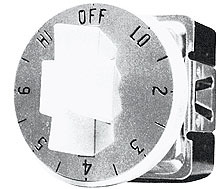 Slow make and break single pole single throw switch cannot be used for pilot duty with a magnetic contactor. Temperature adjustment knob or set-screw adjustment is an option. An inexpensive but positive control for laboratory or industrial hotplates, this series can also be used for controlling comfort heaters, small electric furnaces, dies, platens and other applications where infinite control is required within the current rating of the switch. Simplicity. No cams or levers to adjust. No motor to burn out. Bi-metal acts at settings less than HI to limit electrical input and depress temperature. For higher ac and all dc heating loads, use magnetic contactors. Gives infinite control for non-inductive loads up to 15 amperes on 120 or 240 volts. Can be turned either to left or right to select proper heat from 0 to 100% wattage with infinite control over first 50% of total wattage. Energized continuously in HI position, at other settings it delivers selected input level under control of a simple bi-metal timer. Only 3 mounting holes are necessary to install in box or panel.